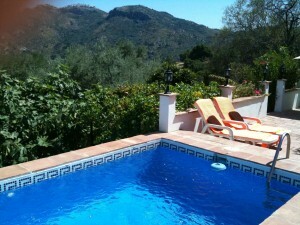 133m2 3 bedroom house with a swimming pool and mainly flat land with fruit trees and fantastic mountain views. This lovely property is situated in Las Yeseras on the way to El Romo from Las Cuevas, under Comares and comprises parking area for several cars with car port, barbeque terrace, covered terrace with steps down to pool terrace with shower and under terrace storage, steps down again to the land with several fruit trees. The pool terrace has 2 lemon and 2 orange trees. The property comprises living room, lounge with fireplace, bedroom 1 arch to bedrooms 2 and 3, shower room and kitchen with door to front terrace. Good Access.